One of the greats of New York talk shows just passed. 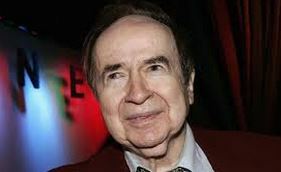 Joe Franklin. He was ONLY 88, but he’s been around for so long, I thought he was in his 90s. or older. As a kid growing up in the Bronx, ever-glued to my television set., I always watched him whenever he came on. Which seemed to be always. He was omnipresent and I kept trying to figure out just why he had so, er, undistinguished guests. Until years later, I became one. He was shooting his show in, I think, a TV Studio in New Jersey.I don’t know how I ever got on his Show. He was very finicky and he did all the booking himself. He was a real one man band, like I am. And you had to really pursue him, and call back a million times, it seemed. I was in the early regional theater days of my show, and we had just all traveled to Boston. To cover ART, the American Repertory Theater, run in those days by Robert Brustein. And FINALLY Joe booked me. I couldn’t believe it! ANOTHER childhood dream come true! And then, there I was sitting on the sofa opposite him, with, I think, at least two others guests, a male to my left and a female to my right. And I noticed something I hadn’t expected to find. He was just as nervous as I was! He put very unusual people together and then would mix it up, rapid firing questions like they were torpedo pellets. And I made the incredible, stupid mistake of saying that ART was doing something like “tap-dancing Ibsen”(which they really were) and I had said the bad word “Ibsen.” I don’t think Joe knew who that was. And then he switched the rest of the questions to the other two panelists, and didn’t come back to me again. But at least I had made it on to his show. By this time he was on in the middle of the night on RADIO! You had to be there, like at 3 AM! And I don’t know if I did one or more shows this time. I remember him coming out and exclaiming with gusto”You did great, kid!” I thought I was talking to Florenz Ziegfeld. Oh, Joe, we’ll miss you! He was the essence of New York Show Business.